Watching this movie at the moment. It seems set in Spain during their Golden Age. Pretty good so far! I probably should have given more than just link to the YouTube trailer for the movie. It is based on the books by Arturo Perez-Reverte. It is set during the Golden Age of Spain. Kind of like a more realistice version of those times. Less swash and more buckler. I plan on reading the first book of the series. Thanks for the recommendation, I had no idea the book had been filmed! Picked it up cheap on Amazon video and watching it now. Visually, it's stunning! Love the opening scene of the Spanish soldiers wading through the water with muskets held high, then Alatriste gently blows on the matchcord around his wrist to keep it lit. And the scenes in the tunnels at the siege of Breda...brutal!! It is the little things that made the film for me. The having to keep the match cord going, the cut of the clothing. or even the poet willing to cross swords over a perceived slight. It's almost required viewing for Renaissance players - "stuff looks like this!" Reading the 1st book. Quite good. I enjoyed the books. I think they would be better in the original Spanish, the English versions suffered in the translation. Going back to the film...tercios!! Don't think I've seen that on film before!! Well, I cannot read Spanish,so English for me. Though the poems could have been is Spanish, with the translations in the back. Except book 7 (?) "The Bridge of Assasins" was released in Spanish in 2011, and 8 years later I am still impatiently awaiting an English translation. 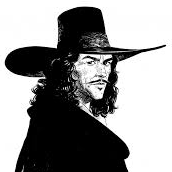 But the first 6 Alatriste books were enjoyable, translatory problems or not.